"Mission 'Capture the bird' was not fully successful, sir. The surprise raid yesterday night encountered unexpected resistance. While the bodyguards were neutralized, the enemy agent managed to swallow a suicide capsule. There will be no chance of interrogation, I'm afraid." "Not fully successful, you say? I would call that a complete disaster! Vital information is now irretrievably lost to us!" "Not quite, Sir. We managed to retrieve the personal laptop of the agent. It should hold all the data. It is, naturally, encrypted and locked by a high-security system, though." "And we have the passcode?" "Not yet, but we are lucky. 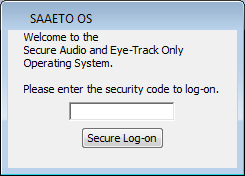 It is one of our bugged laptops which has a key-logger installed. So we have all keystrokes right from the first boot-up after buying it, Sir. A copy is stored on your computer." "Excellent. Nobody has touched the laptop since it was taken?" "Well, let's fire it up then." "Interesting, this is not a standard OS boot. Well, here comes a prompt..."
"What was the last used keyword according to the log?" "That would be the eight-letter sequence K.Q.Y.E.K.G.I.S, Sir. All capital letters." "Hmm, lets give it a try then..."
"Damn it. Would have been too nice, wouldn't it? Maybe we'd better leave this to some experts. Call Mr.S, will you? He should take care from here." 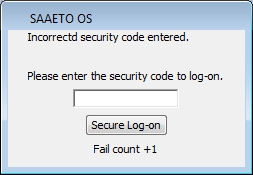 From the information provided, can you tell what security code needs to be entered at this moment now? The key-logger's complete log can be found below. Unfortunately there has been a bit of data-loss. Corrupted characters are marked as ~. It seems passwords are changing every midnight, and also when there is a failed login. @Mr.Burns added an explanation in his comment how these are related to the setup parameters. The set of characters being used seem to be odd-numbered letters of alphabet: ACEGIKMOQSUWY (the only exception is the B typed in the second attempt - but that can be a typo). Maybe this relates to parameter 'i=2'? If we convert the first letters to numbers according to where they are in the alphabet, the first password turns into: 2, 3, ?, 7, 11, 13, ?, 19. This pattern wasn't too hard to recognize: 2, 3, 5, 7, 11, 13, 17, 19 are the first prime numbers. The next password confirmed my natural suspicion, that the keywords are the list of prime numbers modulo 26, converted to letters. so it seems there isn't an automatic password update after a day without login, dc stands for day change. So then the question reduced to finding primes indexed 201 to 208. Those are 1229, 1231, 1237, 1249, 1259, 1277, 1279, 1283. Modulo 26: 7, 9, 15, 1, 11, 3, 5, 9. Transformed to letters: G, I, O, A, K, C, E, I. Not the answer you're looking for? Browse other questions tagged pattern password cryptography or ask your own question.